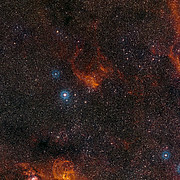 Astronomers at ESO have captured the best image so far of the curious clouds around the star cluster NGC 3572. This new image shows how these clouds of gas and dust have been sculpted into whimsical bubbles, arcs and the odd features known as elephant trunks by the stellar winds flowing from this gathering of hot young stars. The brightest of these cluster stars are much heavier than the Sun and will end their short lives as supernova explosions. 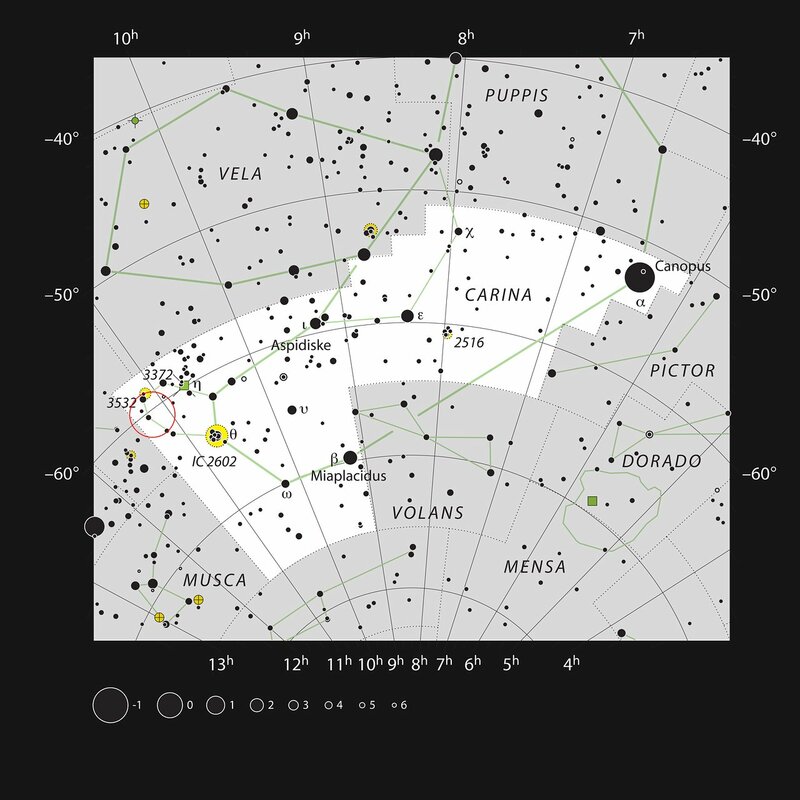 Most stars do not form alone, but with many siblings that are created at about the same time from a single cloud of gas and dust. NGC 3572, in the southern constellation of Carina (The Keel), is one of these clusters. It contains many hot young blue-white stars that shine brightly and generate powerful stellar winds that tend to gradually disperse the remaining gas and dust from their surroundings. The glowing gas clouds and accompanying cluster of stars are the subjects of a new picture from the Wide Field Imager on the MPG/ESO 2.2-metre telescope at ESO’s La Silla Observatory in Chile . In the lower part of the image a big chunk of the molecular cloud that gave birth to these stellar youngsters still can be seen. It has been dramatically affected by the powerful radiation coming from its smoldering offspring. The radiation not only makes it glow with a characteristic hue, but also sculpts the clouds into amazingly convoluted shapes, including bubbles, arcs and the dark columns that astronomers call elephant trunks . A strange feature captured in this image is the tiny ring-like nebula located slightly above the centre of the image. Astronomers still are a little uncertain about the origin of this curious feature. It is probably a dense leftover from the molecular cloud that formed the cluster, perhaps a bubble created around a very bright hot star. But some authors have considered that it may be some kind of oddly shaped planetary nebula — the remnants of a dying star . 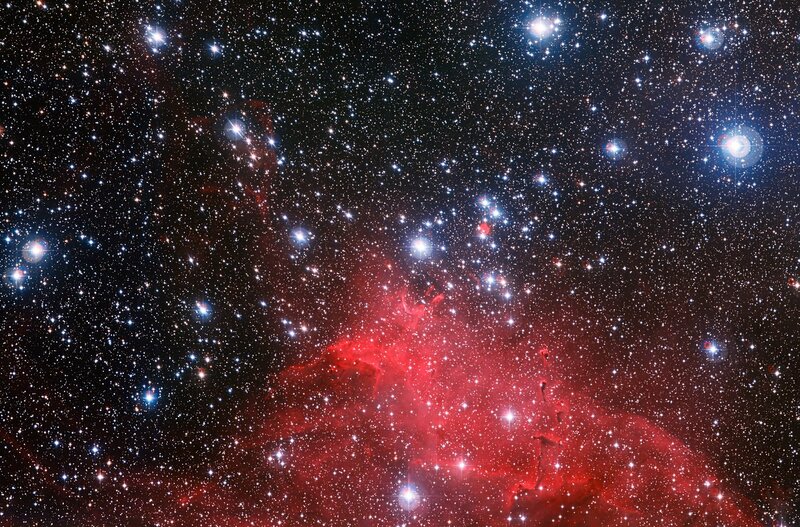 Stars born inside a cluster may be siblings, but they are not twins. They have almost the same age, but differ in size, mass, temperature, and colour. The course of a star's life is determined largely by its mass, so a given cluster will contain stars in various stages of their lives, giving astronomers a perfect laboratory in which they can study how stars evolve . These gangs of young stars stick together for a relatively short time, typically tens or hundreds of millions of years. They are gradually disbanded by gravitational interactions, but also because the most massive stars are short-lived, burning through their fuel quickly and ultimately ending their lives in violent supernova explosions, thus contributing to the dispersion of the remaining gas and stars in the cluster. The data used to create this picture were obtained by a team led by ESO astronomer Giacomo Beccari. They used the power of the Wide Field Imager to study the physics of protoplanetary discs in the young stars in NGC 3572. They were surprised to find that this cluster contains stars older than ten million years that are still unambiguously undergoing mass accretion and, therefore, must still be surrounded by discs. This proves that the star formation in NGC 3572 has been ongoing for at least 10–20 million years and would imply that the planet formation process could proceed on much longer timescales than previously thought. The most famous examples of such elephant trunk features are the Pillars of Creation in the Eagle Nebula, which were captured in exquisite detail by the NASA/ESA Hubble Space Telescope (http://www.spacetelescope.org/images/opo9544a/). When a Sun-like star uses up all its fuel, it puffs its outer layers off into the surrounding space. The hot remains of the star continue to shine strongly into this material, creating beautiful but short-lived glowing shells of ionised gas and forming a so-called planetary nebula. This historical name is only related to the appearance of the object in a small telescope, not to a physical relation to a planet. The lifetime of a star depends dramatically on how heavy it is. A star fifty times more massive than the Sun will have a life of only a few million years, the Sun will live for about ten billion years whereas low-mass red dwarf stars can live for trillions of years — much longer than the current age of the Universe.